>> CLICK HERE FOR THE UPDATED SHOPIFY TRAINING! Bet you didn’t expect to hear from me on a Sunday. Well I was too excited to wait til tomorrow to share with you that my Shopify training videos are all done and ready to give you that boost of confidence to go forth and conquer building your stand alone site once and for all. You NEED to have your own site + here’s why. Here’s the deal: start your free trial or start a plan on Shopify with my link and I’ll send you access to the video training FOR FREE. That’s right, all you have to do is use this link, start a trial or plan, and then email hello@merriweathercouncil.com! Once we verify you are a referral, you’ll get access to my videos. 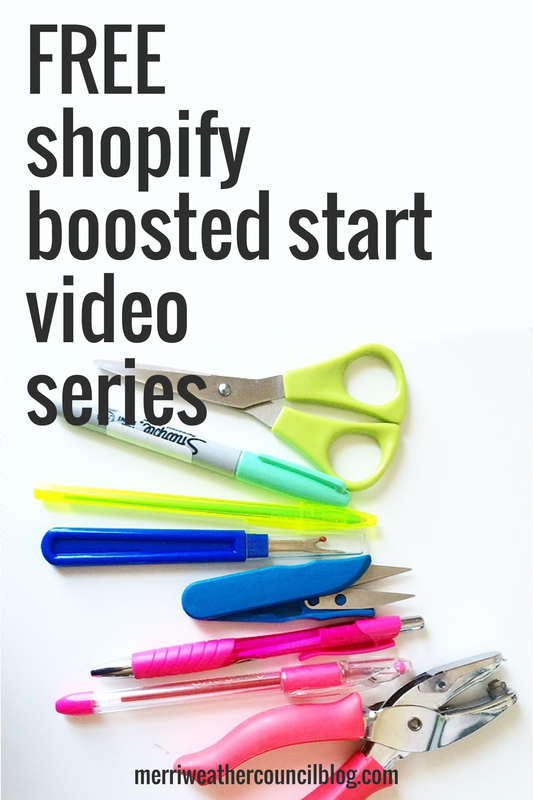 This Boosted Start series includes 8 screencast videos: 7 of them are brand spanking new, and one of them is the video tour of Shopify I did here on the blog, but I’ve included it anyway for you to download with the set. There is also a list of resources for you included. I created this series because I know it can make your head spin to try to tackle a brand new platform on your own and going in totally clueless is so so intimidating. While I do find Shopify easy to use and fairly intuitive, I know that having a little guidance is key to just about everything in life. I also know that having your own standalone shop outside of a marketplace site is SUPER IMPORTANT and one of the smartest things you can do for you business. So I want to help you establish those roots of autonomy for yourself and start taking more control of your online presence and brand overall. Email me right after registering your Shopify account (that you started using my link *wink*) at hello (at) merriweathercouncilcom ! The only info I can access is the shop name, so unless I already know you, I probably won’t be able to find you! Even still, email me anyway! This series will be available to purchase for a small fee to those of you who did not use my link to start your accounts. You can purchase access to this series here. This training series is meant to get you going + lessen the intimidation factors surrounding Shopify. A little guidance can go a LONG way, trust me. I can’t wait to see your shops! Hi. My shop on etsy was Lola’s Jewels. I have since changed the name to Souls Inspiration and I opened a shop on Shopify through your link. How did you get your Etsy shop imported easily to Shopify? hi michele, you can download your etsy items as a CSV and then upload to Shopify! Hi Danielle! Is your Shopify store an online store? Or do you use the basic $9 plan and connect it to WP via the widget? I have a WordPress site and love my theme but hate Woo Commerce, which is why I am thinking about changing to Shopify all together. Any thoughts would be greatly appreciated. I’m using shopify, yes, at the $29/mo level. It is a platform. My blog is wordpress and my site is shopify – geo separate domains! Hi, is this offer of free videos still up? I opened my shop with your link a few days ago.. i’m struggling with it a lot haha i have no clue where to even start! Totally! Just email me themerriweathercouncil AT gmail.com Sometimes I can’t track people down based on the limited info available in the shopify log. I would just link them rather than redirect! Is your videos ‘over the shoulder’ and REALLY, how easy is it to set up and be successful? I am in the middle of taking your Etsy Training Course, and now i’ve come across this article! I agree, I really need to get my own shop off of Etsy Marketplace. I have a squarespace website and was going to set up a shop through them, but I’m confused about Shopify. Can I have a shopify shop on my squarespace? Or no? This kind of confuses me! I’d love to know what you reccommend! Hi Danielle, Do you have the $9 monthly shopify account of the $29? I’m in ottawa (home of shopify) and I’ve considered them for my other business site but ultimately found their monthly rate of $29 to be too steep. The $9 option seems new but I don’t know if it would give enough to make a real site. The $9 a month plan doesn’t give you a website, it gives you buy buttons on other sites. So if you have a wordpress site you can add buy buttons to it and process orders through shopify. It’s not as ideal. Hi Danilee. I just opened a Shopify account/shop so I could watch your vieos. How do I get to the videos. I don’t want to start doing things on the shop and make a bunch of mistakes. Help! Oops. I spelled your name wrong, Danielle. apologies! Thank you so much Danielle! I’ve been wanting my own site for a long time and just haven’t done it. This is great motivation and I really appreciate all of your educational help! i used your link to start a shop on shopify. how do i receive your free videos?